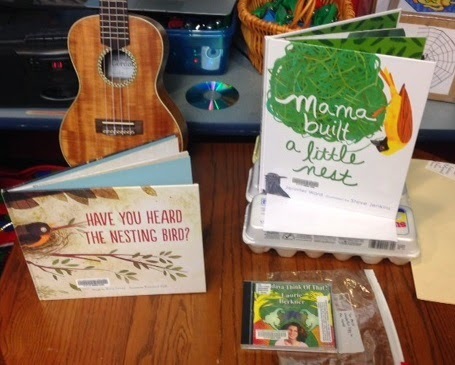 Book: Have You Heard the Nesting Bird? by Rita Gray. This book includes lots of fun bird sounds and led really nicely into the kookaburra sounds I wanted to share with them. Song: Kookaburra, sung with ukulele. I introduced the uke first since we have not yet used it a TON in storytime. I shouldn't be so shy to use it - it holds their attention SO WELL. Save some gum for me! Media: After I sang the song, I brought out my laptop and showed the kids this short video so they can hear what a kookaburra actually sounds like! Before I started the clip, I let everyone know that I hoped they could see but if not, it was okay. I really wanted them to LISTEN to what the kookaburra sounds like. Felt Story: The Most Wonderful Egg in the World by Helme Heine. Oh, they laughed and laughed at this funny story about hens trying to lay the most wonderful eggs! Song: I Know a Chicken by Laurie Berkner with shaky eggs. Of course, a story about eggs lent itself beautifully to breaking out our shaky eggs and shaking them to this song. 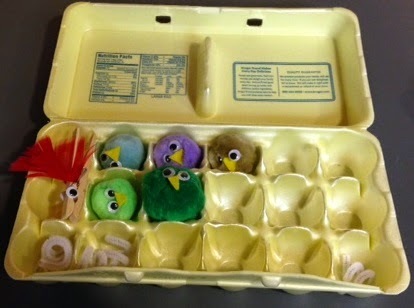 I played the song on CD and helped lead the kids in shaking their eggs like the song instructs. Feed the Baby Birds. This activity comes from Powerful Mothering and it's another simple activity great for developing fine motor skills and reinforcing science concepts. I made "baby birds" out of large pom poms (hot-glued on wiggle eyes and yellow felt beaks), "worms" out of white pipe cleaners (curl them around your finger), and "mommy birds" out of clothespins. Kids could use the clothespins to feed worms to the baby birds and move them around the "nest". I had a few friends who camped out at this station and didn't want to leave it behind! Bird Beaks. This one is from To the Moon and Back, adapted with what I had on hand. 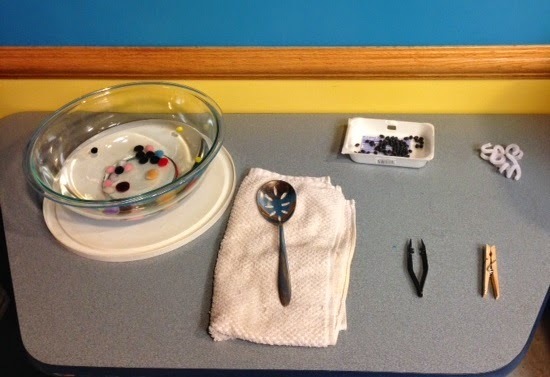 Each tool (slotted spoon, tweezers, clothespin) represents a different kind of beak you might find in the bird world. Which type of beak works best for each food? 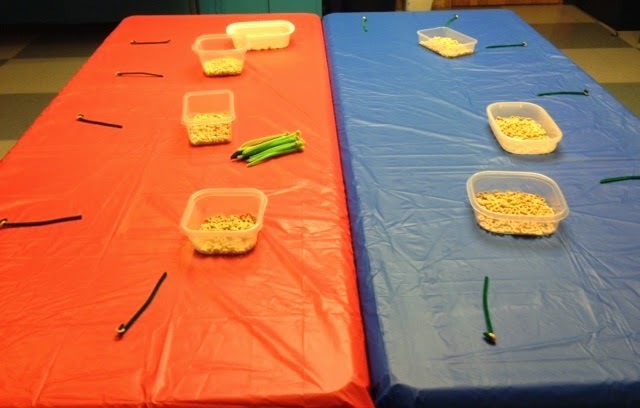 The foods I used were small pom poms (replacing the mini marshmallows that Dusty used because I was afraid those would get eaten), dry black beans (leftover from last week's sound program), and more of our pipe cleaner "worms". I tried to talk to kids as much as I could at this station because while they loved dumping everything in the water and stirring, it's not a very self-explanatory station. This might be a better station with a smaller group or one-on-one. We had our biggest crowd yet for this Preschool Lab (I counted 30 kids in the room) and I'm so happy to share a program I felt great about with such a great crowd! We only have one more week of summer Preschool Lab, and I'm definitely going to write up how the program went overall once we're done.